rekbender had the most liked content! Anything old and mechanical that can be taken apart. This is just a thought. You mentioned in your original post that the spreader spring was on the second gear synchro. The service manual shows it behind the high gear stop ring and the clutch gear hub, not second. i still have the '51 transmission in pieces, so I put the spreader ring behind the second gear stop ring and assembled the clutch gear to the main shaft. It could be assembled with the spring tabs either toward the clutch hub, or toward the stop ring. Either way, it does interfere the with the stop ring free movement, and would become deformed if the clutch gear snap ring was installed. Did your transmission ever shift smoothly into second? First picture is spreader spring in the clutch hub hi gear side where it belongs. 2nd picture is the spring itself. That spring is called a spreader spring. I've seen this in a 1951 Plymouth transmission. 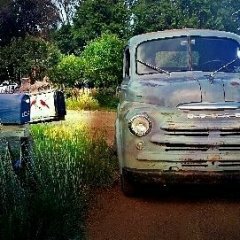 I don't remember my '49 synchro as having it, although the stop rings were the same. 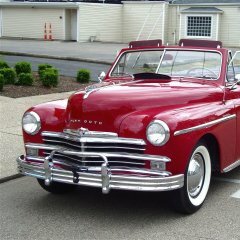 The only picture I can find is in the 1946-1954 Plymouth service manual, and only in the overall parts breakdown picture. They don't mention the spreader spring at all in the synchro section, or the main shaft assembly section. The OD section does show two adapter (mid-plate) screws. Do you know if a 1951 Plymouth parking brake drum will interchange? I have one with a 6" OD. Nice car. 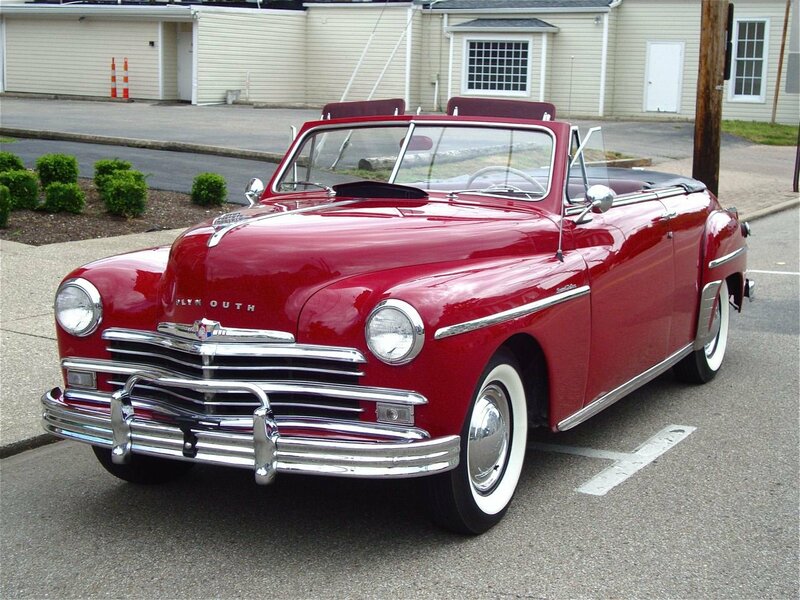 My first car was a '54 Dodge 4 door. A neighbor (original owner) gave it to me with just under 100K in 1965. Great dash, tutone green, 241/powerflite, bullet proof. I still miss that car. I'm jealous. The problem may be the wrong thermostat. The thermostat housing in the picture is a by-pass housing like the ones used on earlier blocks without the internal bypass. I've seen three different designs for these housings and each requires a unique thermostat (the old bellows type that don't work in a pressurized system) to block the by-pass passage in the front of the housing when the engine is warm and the thermostat open. If the by-pass passage isn't blocked, too much coolant by-passes the radiator and just circulates within the block. A later housing made for a wax pellet type thermostat may cure the problem. I ran into this a while back and it drove me nuts until I figured it out. If the housing in the picture is a P18 type, Stant makes a thermostat/adapter package that will work correctly in the P18 housing. Hope this helps. My '37 Plymouth PT50 had the tire size and class stenciled on the bed side. It had been parked since 1952 in a building in Indiana. Photo is from around 1980. Factory rims on a 1949 P18 S. Deluxe conv. When I was doing frame straightening, we had a local shop that straightened bent wheels, both steel and alloy. It was surprising what he could save - as I remember the cost was $50.00 to $150.00. There is probably someone locally that could check your wheels and straighten them if necessary. With the tires off the wheels, you could mount them on a balancer or a front spindle and spin the wheel. You will see the wobble if it's much more the 1/16". On steel wheels, sometimes the outer edge of the lip where the tire mounts isn't truly concentric, but if you dial indicate the inner surface where the tire mounts, the run out isn't as bad. In the old days, we would spin the front wheels, look for wobble, and mark the extremes in run out, and then mount the camber/caster gauge between the extremes. We did this on every wheel as many steel wheels had some wobble. The wheels on my P18 weren't perfect, a couple maybe out 1/8", but the reproduction bias ply tires really weren't round and had wobble. You can rotate the tire on the wheel to find where it runs most true. The best thing to do next is have the tire trued on a tire lathe or shaver. This will make the tire truly round, produce the smoothest ride, and increase tire life. As a bonus, a trued tire will often require less weight to balance. I trued the tires on my wobbly wheels and just static balanced them. The car is smooth as silk at 60. Balancing will not correct an out of round tire. I have an NOS heater core that I bought I for a Model 65 heater years ago and never used. The same measurements as yours. Honestly though, it doesn't look any better than yours. $75.00 and shipping. PM if your interested and I will pressure test it. Back in January, I bought a large lot of '35 PJ parts from a hot rodded car. The owner had tried for months to sell the entire lot on CL with little interest and no takers. I advertised them here (some interest) as well as my local CL, but again, no sale. I finally posted everything to a Hemmings internet parts ad. They featured my ad one Saturday on their Hemmings Daily email and my parts sold that week. Don't overlook Hemmings - their on line ads not expensive. Parts lots can be hard to sell unless they are are really cheap (I love cheap parts lots). Do list them here on p15-d24 and see what happens. Are you willing to sell individual items? Yeah, it's a lot more work that way. I've done this on both thermostats used on a '41Mercury flathead, as well as the thermostat I just replaced in a Dodge 318. It makes filling block much quicker without having to burp the cooling system repeatedly. You will also see this hole on some thermostats like this Nissan I found in my junk stash. This one even has a little valve to block the hole when coolant is flowing. Some foreign engines ( Renault Alliance) were a real problem to get the the trapped air out of the system. I don't think bypassing this small amount of coolant hurts a thing, although I've never tried it on a MOPAR flathead. This may not qualify as a '48 to '53 option, but I found this little Job Rated accessory screw on clipboard about 15 years ago at a swap meet. I never screwed it to the dash, just used a magnet instead. When I sold the B4C in 2007, I kept the clipboard. I think the little paper pad is original. This is just a guess. but I think the pump should look something like this. Note the stud that screws into the base for the heat shield. The fuel pump on my P18 looked like this one, but with a metal cover on the bottom that did away with the sediment bowl. I think it was correct for the '49. I rebuilt this one because I like the visible bowl and screen arrangement that can be cleaned. 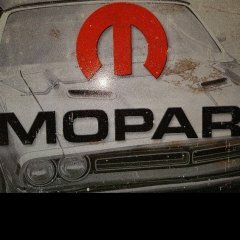 I bought a Dodge engine years ago that had a combination fuel pump/vacuum pump. It also had the off-set stud and heat shield. I have a Carter fuel pump with the stud in the center, and there are a number of heat shield variations. The 2nd picture is a heat shield mounted to an earlier fuel pump. Someone here can tell you for sure. This is a 1954 D51 block with a 218 crank and no external rear main seal holes. You'll have to remove the pan, loosen the front three main caps, and remove the rear main cap. Pry up on the flywheel (1st picture) to take pressure off the upper half of the seal (it's captured between the crank and block) and give yourself some room to pry the seal half out (2nd picture). 3rd picture is the new two piece seal. Lubricate and slide the new half seal in around the crank journal (4th picture is new half installed). Install the other half in the main bearing cap and reassemble. Don't forget to check the crankshaft end play .003"-.007" (5th picture). If the end play is too great, this is the time to replace the bearing. This is a much better design than the bolt on seal. Unfortunately, you can't use this design in the earlier blocks. Here's a dis-assembled convertible vent window. Is the top serrated stop washer loose? I've had some pretty good success with a penetrant called Free All when used repeatedly over three or four days. Keep spraying and tapping with a brass hammer.